Product prices and availability are accurate as of 2019-04-18 05:16:56 EDT and are subject to change. Any price and availability information displayed on http://www.amazon.com/ at the time of purchase will apply to the purchase of this product. Adenna Self-Sealing Sterilization Pouches are designed for use in steam (vapor) and ethylene oxide (ETO) sterilizers. They are manufactured in an ISO certified facility under strict quality control. They feature both built-in internal and external indicators to confirm sterility of the contents, meeting the CDC’s recommendation. 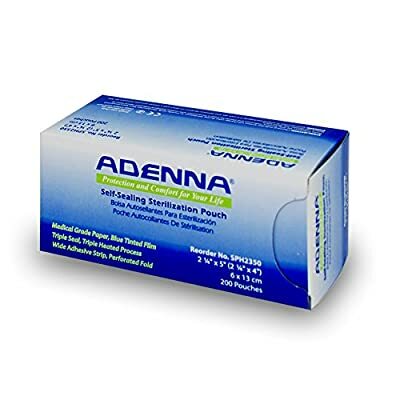 Adenna Self-Sealing Sterilization Pouches were evaluated by the Dental Advisor (TDA) independent clinician consultants in over 5,800 uses and received an 86% clinical rating, + + + + (Very Good) out of the best 5 +’s scale. Process Indicators - Built-in internal and external indicators that change colors to confirm sterilization is complete. 2 1/4 x 4 inches (57 x 100 mm), 200 pouches per box Triple Seal, Triple Heat Process - The edges of the pouch are sealed by three separately heat-sealed rails, which is stronger than single sealed rail, to prevent separation or tearing by instruments. Blue Tinted Transparent Film - Easy viewing of instruments and identifying any punctures or tears should they occur. Medical Grade Paper - Durable medical grade paper, wet strength treated for high performance.